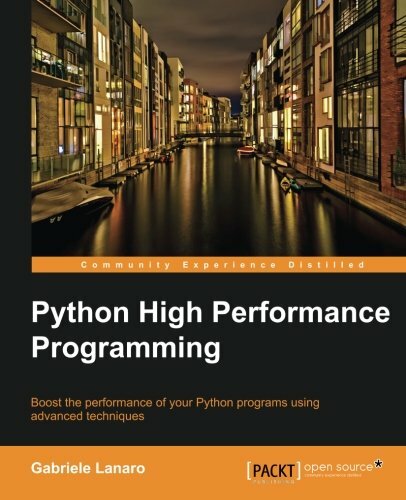 This book is an example-oriented guide to the techniques used to dramatically improve the performance of your Python programs. It will teach optimization techniques by using pure python tricks, high performance libraries, and the python-C integration. The book will also include a section on how to write and run parallel code. This book will teach you how to take any program and make it run much faster. You will learn state-of the art techniques by applying them to practical examples. This book will also guide you through different profiling tools which will help you identify performance issues in your program. You will learn how to speed up your numerical code using NumPy and Cython. The book will also introduce you to parallel programming so you can take advantage of modern multi-core processors. This is the perfect guide to help you achieve the best possible performance in your Python applications. An exciting, easy-to-follow guide illustrating the techniques to boost the performance of Python code, and their applications with plenty of hands-on examples. If you are a programmer who likes the power and simplicity of Python and would like to use this language for performance-critical applications, this book is ideal for you. All that is required is a basic knowledge of the Python programming language. The book will cover basic and advanced topics so will be great for you whether you are a new or a seasoned Python developer.